We take you around Freemasons' Hall at Mumbai. We show artefacts of interest. To see detailed images you can click on any of the pictures. 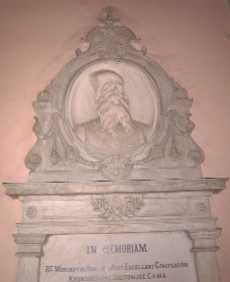 The marble wall plaque of Bro. K. R. Cama adorns the entrance chamber of Freemasons' Hall. The marble wall plaque that adorns the entrance chamber of Freemasons' Hall right opposite you as you enter. A street side view of Freemasons' Hall, Mumbai. A picture from the archives, Freemasons' Hall, Bombay, 1912. A picture from the archives, Freemasons' Hall in Philadelphia, USA, in 1912. A view from Freemasons' Hall showing the splendid structure of the erstwhile Tata Palace across the road. The Corner Stone of Freemasons' Hall. It is located at the entrance adjoining the marble wall plaque, mentioned above. The Organ in the Sandhurst Temple in Freemasons' Hall. Two views of the Sandhurst Temple in Freemasons' Hall. The justification of our existance - the warrant issued to the District by the Grand Lodge of Scotland. Photo taken in Calcutta on 18th February 1967, which shows the then Most Worshipful Grand Master Mason, Bro. Major Sir Ronald Orr Ewing, Bart., J.P., D.L. with the then District Grand Master of Eastern India, Bro. Ira Brown. Bro. Major Sir Ronald Orr Ewing is the father of the present Most Worshipful Grand Master Mason. This photograph was taken on the day after Bro. Ira Brown was Installed as the District Grand Master of the District Grand Lodge of Eastern India by the then Most Worshipful Grand Master Mason, and just prior to the Centenary Celebrations of Lodge Endeavour No. 474. Candelabrum dated 1858 used at all the installation meetigs of Lodge Perseverence no. 338. Ram's head with jewel inlaid snuff box used at installation meetings of Lodge Perseverence no. 338. Founder Member's Jewel of Lodge Gibbs No. 1090, Bangalore. The Lodge was founded on 3 rd August 1911 and is now under the Grand Lodge of India.